Once payment has been received we will register your details with APMG International who will then forward your details on to ProctorU (the online examination company) who will liaise with you directly regarding confirming the exam date and time. 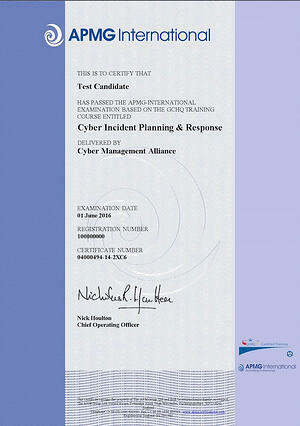 All students must have registered and paid for the GCHQ-Certified Cyber Incident Planning and Response course. Payment must be made in full prior to student being registered with APMG for the examination. Once course is complete students will be sent an email by APMG International. Students will receive access to the exam portal. Student scan then arrange suitable online exam times with Proctor U. All results and digital certificates are distributed by APMG International. Please find below some further information on technical requirements in order to sit the online examination.